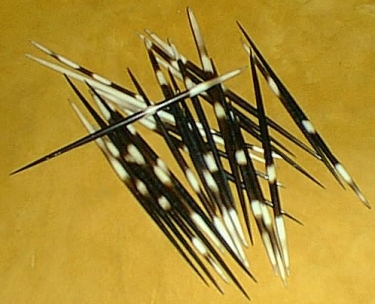 Porcupine Quills in a really long length come from the African porcupine. They do not have the barb on them so there not as difficult to work with. They are used for hair pics and fishing floats. They make wonderful pens. Let your ideas take over. Short ones will be somewhere between 4 inch to 9 inches long, and the longer ones will be from 10 inches to 19 inches long. Items offered for sale by Wooden Hawk Trading Co. are legally taken and can legally be sold by us in accordance with the laws of the state of Texas. When you order any item(s) from us, we assume the item can be possessed by you in accordance with the laws of your state/country. In the event that you order an item which you cannot legally possess, Wooden Hawk Trading Co. will hold you responsible for all legal fees and penalties incurred.